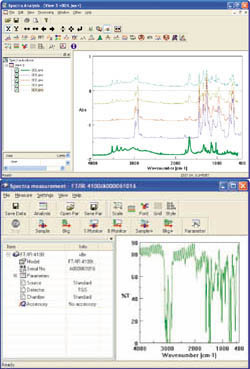 Spectra Manager II is the latest version of the JASCO innovative cross-spectroscopy software platform. The approach of having a single platform for data analysis is a unique and powerful way to manipulate and display data from any JASCO spectroscopy system. UV/VIS/NIR, Fluorescence, FT/IR, CD, ORD, LD, Raman, FT-Raman Polarimeters and other types of data files can be directly compared, processed, and printed together. Drivers are available to control each JASCO spectrophotometer. Parameter setting screens allow easy editing of pre-saved parameter files. 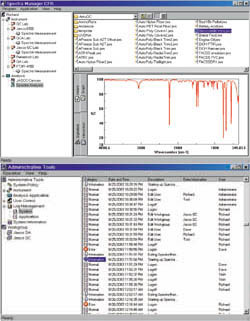 Data acquired from each instrument is automatically loaded to the analysis program (running in the background) in order to free up the PC and control software to acquire more data. Each instrument driver has a module to allow for instrument hardware diagnostics and validation. Digital and graphical data transfer through the clipboard. Spectra Manager CFR provides secure access and compliance features for 21 CFR Part 11, system Access requires user name and password which are assigned by the Workgroup Manager and Access Level determines access to Administration Tools which includes instrument installation analysis application installation, user setup, workgroup setup, security policy as well as system and application history logs. Three levels of electronic signatures are required including a creation, review, and approval stages. An audit trail is assigned to every data file recording data manipulations on special data.